A small team from Tunbridge Wells Taekwon-Do went to the Vision Taekwon-Do Association Annual inter-club competition in Crowborough. It was the first competition for many of the students and they all conducted themselves excellently, showing courage and perseverance. Well done to Oliver King, Matilda Grove, Harry Cheadle, George Stokes (silver in sparring), Michael Westlake (silver in patterns), Emily Sydenham (silver in patterns), Lucy Thonger (bronze in sparring), Jack Sydenham (gold in sparring, silver in patterns, silver in special technique) and Sarah Budd (silver in sparring, silver in patterns, silver in power). Tunbridge Wells instructor Luke Thompson was so proud to see how well everyone performed. Many thanks to Mss Ware, Mrs Budd and Mr Thompson for refereeing. 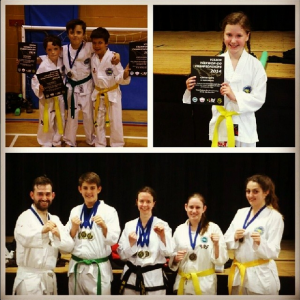 This entry was posted in TKD, Uncategorized and tagged ITF, taekwondo, tkd on 17/05/2014 by Mr T.